I started to dig into this issue because of bad appearance. If you use some if the shorter carriages, you'll get irregular spaces between carriages. I wouldn't add mail nor tpo to luggage versions. There are already dedicated mail /tpo carriages and the mail brake van has also quite a lot mail capacity. Catering also does not make much sense when you cannot walk between cars during the ride. Suburban vs. Luggage is already differentiated by comfort and loading time. That's fine. Luggage cars have higher comfort (no luggage on your knees) and higher loading time. I can make the changes and if James sees fit they'll be incorporated. I'll try to post the improvements side by side. Luggage cars have higher comfort (no luggage on your knees) and higher loading time. I see your point, but I mean nothing about adding a mail hold nor accessible luggage catering during the trip (even if corridored sets allow this). I mean that a dedicated luggage carriage would allow passengers from others to decide that leaving their luggage in the separate car is sensible from a certain length of journey on (trips longer than 2/3 hours aren't usually routine commutes). 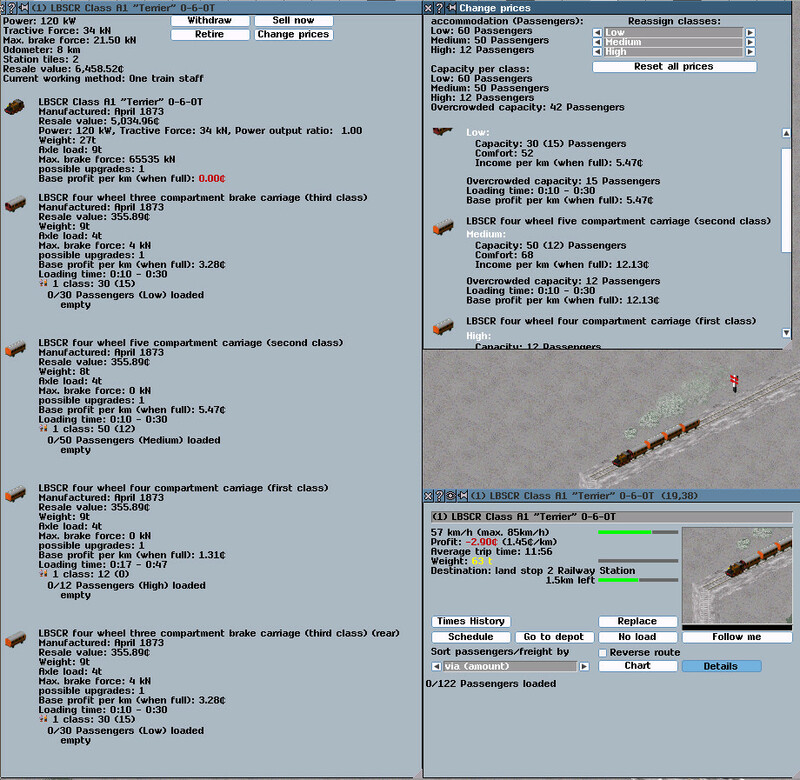 So if the player adds a luggage carriage to a long distance train, it would be beneficial to longer trip taking pax (class dependent). I think I understand what you mean by luggage catering, but that would have to be a bigger dedicated luggage van. The luggage compartments are imho small to fit only the luggage of passengers in the same car. There are some complex issues that have been raised. Firstly, length: it is generally preferable for all carriage graphics to have as accurate a length as possible. The lack of granularity in the length parameter is unfortunate, but all sorts of visual chaos will ensue if we start having carriages of deliberately the wrong length to work around this. Far better would be to work on allowing fractional lengths in the code (although this may be some way off unless someone else codes it). Secondly, luggage: any representation of luggage in comfort must take account of the fact that the luggage carrying capacity of one vehicle in a train can affect the comfort of other vehicles. Doing this would require a change in the code (catering values are unsuitable, as they generate revenue as well as increasing comfort). For this reason, the simulation of luggage cars has generally been omitted, and, if included in some cases, would require revision of the entire pakset to add luggage vehicles to match all of the various railway carriages, which would be a very large task. As for overcrowding, the policy so far has been to allow overcrowding in all but first class carriages/compartments. The general rule of thumb is, for non-corridor compartment stock, the overcrowded capacity is half as much again as the seated capacity, as generally as many people can stand in the middle of a compartment as can sit on either side of it. 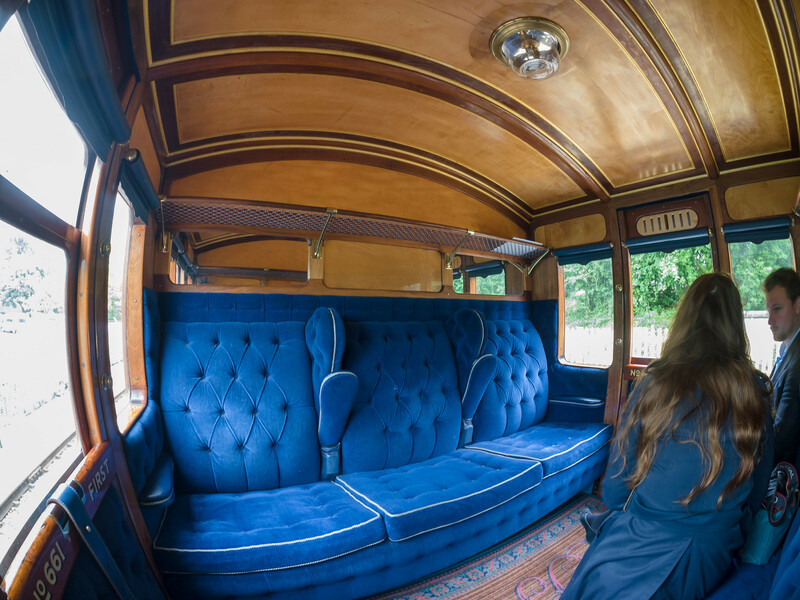 The same holds in corridor compartments, but people can also stand in the corridor, giving a higher ratio of overcrowded to seated capacity, and the same in saloon carriages. Although people may prefer to stand in the corridor given the chance, people would undoubtedly have stood in compartments in corridor carriages if there were no other space available: it is not plausible that people would have refused to get on the train at all just because they have to stand in a compartment rather than in the corridor. People will stand anywhere with enough space if the train is crowded enough. Edit: I have now had a chance to look over the code. I see that you have re-rendered quite a lot of vehicles: that is very helpful: thank you for that. I do take the point about the front/rear full brakes, as the graphics do show them having a particular end. However, one thing that I do notice is that you have in some places (e.g. the LBSCR-4Wheel-First-fitted) added first class without modifying the capacity or comfort. 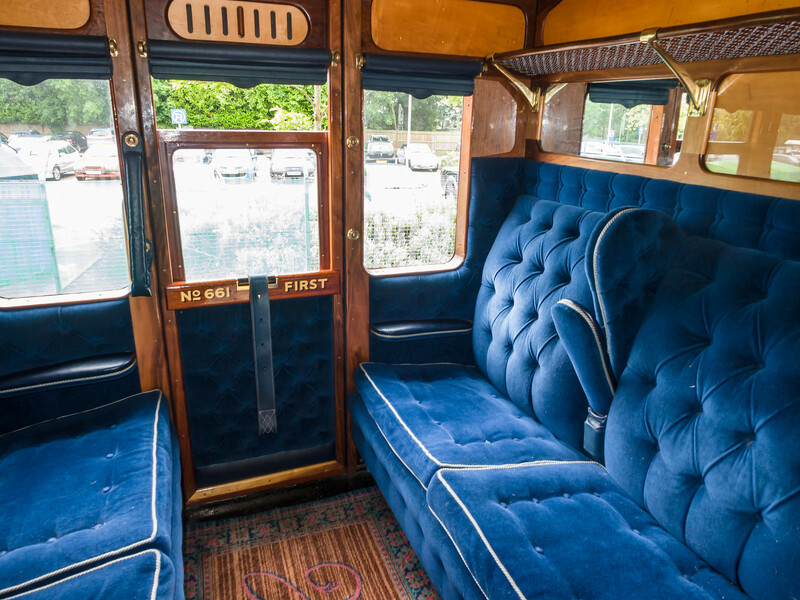 The carriage, although modelled on a first class carriage, had the capacity and comfort that it would have had had it been built as a long-distance third class carriage: before classes were introduced, in the LBSCR carriages, class was used as a proxy for whether the carriages were long distance or suburban. James, thank you for noticing this. I've gone ahead and changed the capacity, updated the comfort and removed/reduced overcrowding (1st=0,2nd=12 of 50). I'll be happy to use the gorgeous pictures in the rest of the album for future reference. I've also moved a blend file or two to the Blends repo and removed some of the older non-transparent images. I was wondering whether we should constrain the LBSCR suburbans as the source provided mentions: "These suburban carriages were close-coupled in semi-permanent sets by a central buffing fixture with side chains, and standard buffers were only fitted to the brake end of brake-thirds." - luggage tricomposite - should have 4-compartments 6+8+2x10 and full length <- Your source is correct, but our carriage has only three visible compartments as seen here. - luggage composite (1/2) - should have 3-compartments 6+2x8, and may be shorter, but should be rescaled. Current 3-compartment image is too long for length=4. Or it could be a 1st + 3rd composite with 4 compartments? <- Is this not a four compartment? Image In any case this can be rendered. - suburban composite (1/2) should have capacity 12+16 instead of 16+16 <- It's a suburban vehicle, where we won't have too much reason to splurge on comfort where not needed. I think we should keep this. I thought about swapping the images for these two. So the tricomposite would be 4-compartments with luggage space in the middle, and 1st/2nd composite would use the 3-compartment image. If there is no reason fir extra comfort, then there is no reason for the 1st classs. I take it that 1st class is 6 seats, 2nd class 8 seats. And the difference betweeen suburban and long distance is only the luggage compartment, that takes approximately the same space as one 3rd class compartment. And 1st/2nd class compartmens have some extra legroom, so only 4 fit the same lenght where 5 3rd class compartments would fit. So for 3rd class it would be like: 5-compartments (suburban), 4-compartmens (luggage), 4-compartments (brake), 3-compartments (luggage+brake). Thank you very much for that: I have now incorporated that (having added the English translation texts for the class names for the 4 wheel carriages). For the 4 wheel suburban carriages, I agree that these should have an exclusive constraint set. Also, you might reduce their length to simulate the shorter buffering, which will allow more of them to fit in short platforms. Your work on adding classes to the pakset is much appreciated. I have been scratching my head at some of the configuration of the lbscr carriages. I'm listing my findings with proposed solutions. Craven Carriages (built 1866 - 1872) - suburban carriages due to their comfort values (lo-38, med-42). The Cravens don't feature a first class. If this is intended due to the suburban nature, that's understandable. The Cravens have mail carriages, which seems unusual for a suburban train. If you're supposed to use them to help connect up the mail networks using select stations with mail capability, we could mention it to players in the vehicle comment/copyright section. As previously mentioned, I've created a third class vehicle and also a composite (source). It is in the newest pull request. These Carriages retire Jan 1872, 6 wheel improvements don't arrive until December 1872. I suggest moving retire_month to November. These carriages are main line / long distance. I suggest I lower the capacities for second, if not third class, to reflect the improved comfort. The brake carriage will be fixed to 62 comfort. I create a set of suburban carriages with higher 1st class capacity, lower comfort across the board, constrained to each other and slightly cheaper purchase price. Thank you for your thoughts in relation to this. A little historical information may be of assistance in working out how these are supposed to work. Before the 1870s, there were no separate long distance and suburban carriages. It was the LBSCR who first introduced this idea, I think, in the 1870s (or, at least, at around the same time as other railways). Early railway carriages were really extremely uncomfortable: they were small and cramped, had a hard ride, were draughty, had no heating (other than the ability to hire hot water bottles at stations), no lavatories and crude lighting consisting of a rapeseed oil pot lamp (one per two compartments in third and sometimes second class quite often) which produced very little light but a fair bit of smoke. Second and third class carriages would have had the same capacity: the difference was simply that the second class carriages had padding on the seats: the third class carriages merely had wooden benches. Going back further beyond the 1860s to the 1850s and 1840s, the third class carriages would not even have had proper windows (save for one in the door). In relation to the retirement date of the Craven carriages, the retirement date is April 1872, the same month as the unfitted Stroudly carriages are introduced. They are available until January 1877. However, fitted Stroudley carriages are available from September 1875 - I am not sure, therefore, what the issue with the dates is: can you elaborate? In relation to your pull request, I imagine that you will need to modify it to take into account what I wrote above regarding 1860s carriages and the differnce between second/third class (unless you did not incorporate these features into the pull request, in which case, please let me know, and I will review it). Thank you very much for your work on this. To the retirement dates: My apologies. I lost overview of the what was happening when. Of course braked four-wheel carriages are available before the introduction of six-wheel carriages. I have not incorporated a capacity difference or suburban stock suggestion in the pull request. The intention was to reduce mainline compartment capacity from 10 to 8 (second and third following your description) and create an explicit suburban set (Cravens don't feature a first class which may be a result of being suburban). The main-line carriages shouldn't be constrained but the suburbans in this case could. I have thought about this further and unless players really want it, it was just a small idea. I've amended files in the pull request to enable automatic merging. The changes are: addition of a composite vehicle, addition of a third class vehicle, fixing first class capacity, moved/removed a few .blend files. I'd like to share that the 1850s to 1860s transition looks very good, the change in stock, locomotive power and track requirements is very nice. Thank you James for your patience with us. I would continue with lbscr-48/54ft-augmentation carriages next, or are there higher priority tasks in transparent workflow conversion? Thank you for this: that is helpful. It is probably better not to have suburban/mainline Craven carriages, as these did not exist in reality. (4) the comfort of the 1872 Stroudley carriages needs consideration: the pre-classes scheme had the 2nd class used as the long distance vehicle and 3rd class used as the suburban vehicle - in the comfort calibration overview.ods file, you will see that the suburban 1870s carriages are at a comfort of 52 and the low capacity carriages (i.e. long distance carriages) are at 62; I note that you change the comfort of the brake carriages from 52 to 62 "to match other vehicles in the set", but these vehicles are a different type and should have a different comfort: use the spreadsheet as the guide rather than the .dat files. Thank you again for your work on this: it is much appreciated. I meant this in regards to Stroudley introduced stock, which were converted main-line carriages. (1) I must have made an error in the fundamental workflow here. Could you point out the missing additions? (2) The Second class vehicle is not intended to be replaced by either the third or composite carriages. I supplemented as the source mentions were built. Just in case, I started a savegame from an older nightly source, running a train with the assembly as I expect intended, saved and loaded in a freshly compiled pak. I encountered no issues. (3) I tried to find the source of this. I think it may be due to the fact that I've added a full brake front and amended the rear entry in en.tab, but this has not propagated to your branch. I do take the point about the front/rear full brakes, as the graphics do show them having a particular end. entries between upstream/master and spenk009/master. (4) That is an application I had not thought of. It's just that the brake carriages have comfort=52, there are no third class carriages to make use of as suburban and the comfort value defined across all comforts in the carriages introduced at the exact same time, scheme, type, looks have: comfort=0, comfort=62, comfort=68, comfort=77. (1) My apologies: I seem to have missed in my previous post that you had added these in the commit on at 1736h on the 15th of February. (2) Looking at this again, I think that I might have misinterpreted the way in which Git for Windows presented the commit: it appeared to involve a deletion of LBSCR-4Wheel-Second and its replacement with LBSCR-4Wheel-third, but in fact it shows this replacement on a copy of the file which you had renamed to provide a new third carriage. My apologies. (3) This relates to the 6 wheel carriages, in particular the carriage with the name LBSCR-6Wheel-guard: the current version in the pakset does not have any constraints defined, but your commit adds the same constraints as for a carriages such as the LBSCR-6Wheel-4-com-first, which would not allow it to be at either the beginning nor end of a train. The 6 wheel version does not have separate front/rear brake graphics. (4) The 1870s carriages, unlike the 1860s carriages, need two schemes: one for the suburban carriages and one for the long distance carriages. Hello, I have noticed that some of the LBSCR 6-wheel carriages have retire year 1892 (passenger non-break), while others (passenger break and mail) have retire year 1907. Is that intended? I think so - the passenger carriages were replaced with bogie carriages, but, initially, bogie carriages were not built for mail/brake applications. But the bogie variants have same intro (LBSCR-non-cor-lav in 1889 and LBSCR-sub-bogie-42ft in 1894) for both brake and non-brake (although no mail). So either the passenger 6 wheelers (both brake and non-brake) should end at same time, probably 1894 or both should be extended to 1907 to match the mail 6-wheelers. Those are the passenger brakes, not the full brakes: the only full brakes available are the 6 wheelers. Yes I just thought that the passenger brakes should have the same intro/retire as passenger non-brakes. So that only the mail 6-wheelers will be available longer. That would leave a period without any full brakes available, which would be problematic as it would prevent the formation of an all mail train. to retire_year=1892 to match all other passenger (non-brake) 6-wheelers. My apologies for misunderstanding: I see what you mean now. I have made the adjustment as requested. Speaking about lbscr-6wheelers, I have noticed that the lbscr-6wheel-mail*.png is much bigger than other lbscr-6wheel-*.png, so it need re-rendering. Also lbscr-6wheel-third-umber*.png is a little bit bigger, although the difference is not so remarkable as the mail car. I think that these are more in the category of vehicles that could do with being re-rendered in due course than bug reports - unless there are vehicles in the same set that have not been re-rendered? Most of the lbscr 6-wheelers are already re-rendered. These are a few I have noticed to look different from the rest. I wonder whether Spenk009 might like to re-render the remaining LBSCR 6 wheelers, in that case?